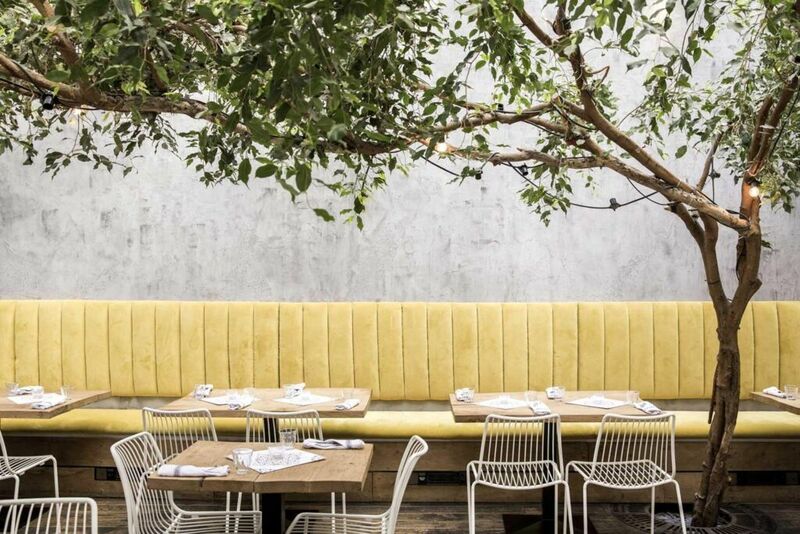 Quirky flavour combinations, to-die-for-dough and interiors you’ll want to share on Instagram. Could this be South West London’s best new pizzeria? Sinking your teeth into a bubbly, chewy, cheesy slice of pizza has got to be one of life’s greatest pleasures. As such, it pays to have a few faithful pizzerias up our sleeves – and London has plenty of them. Well, notepads at the ready pizza lovers because I’m about to give you one more. 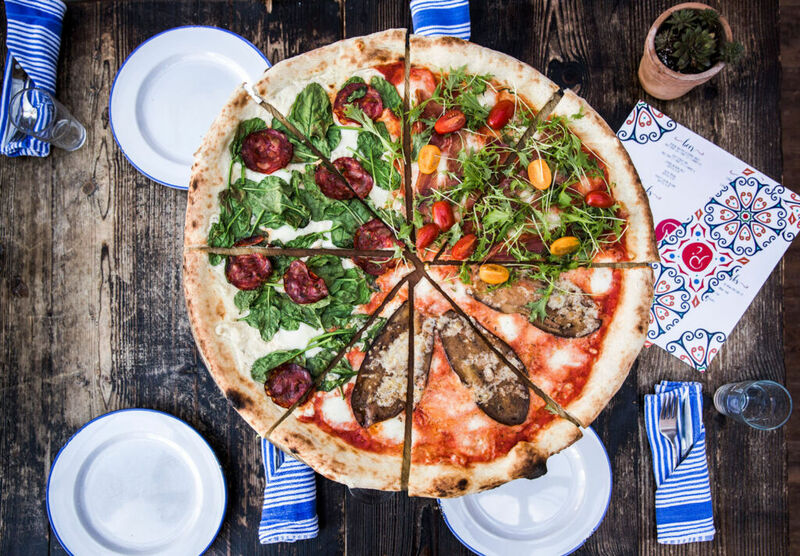 Pi’s a quirky new artisan pizzeria serving up 20-inch Nepal-style pizzas from their hip home in South West London. What makes this place so special is the hand craftsmanship that goes into the making of their dough. Pi’s Italian chefs use a top-secret recipe, involving a 72-hour fermentation process that undoubtedly pays off. Toppings are of top quality. 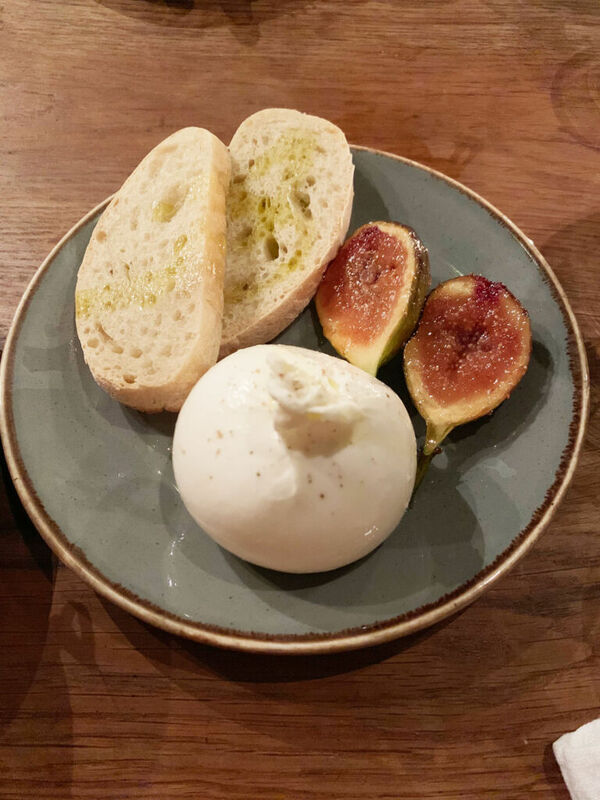 Pi prides itself on working with independent suppliers, such as Winchester cheesemakers, Isle of Wight tomato growers, and Italian and Spanish charcuteries. 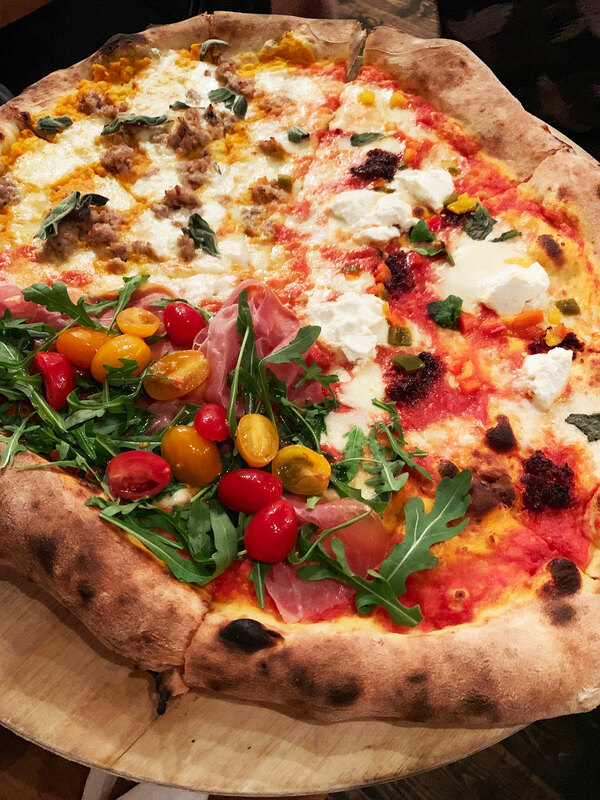 This passion for pizza perfection is driven by first-time restaurateur Rosie Whaley, who opened Pi after a stint working in a Florence pizzeria. Pi’s interiors are dreamy. They’ve gone for a modern Mediterranean feel, with summery pastel colours and lots of greenery. The centrepiece is a real living tree lit with hanging bulbs. Pi Pizza is not an order-by-the-slide kinda place. 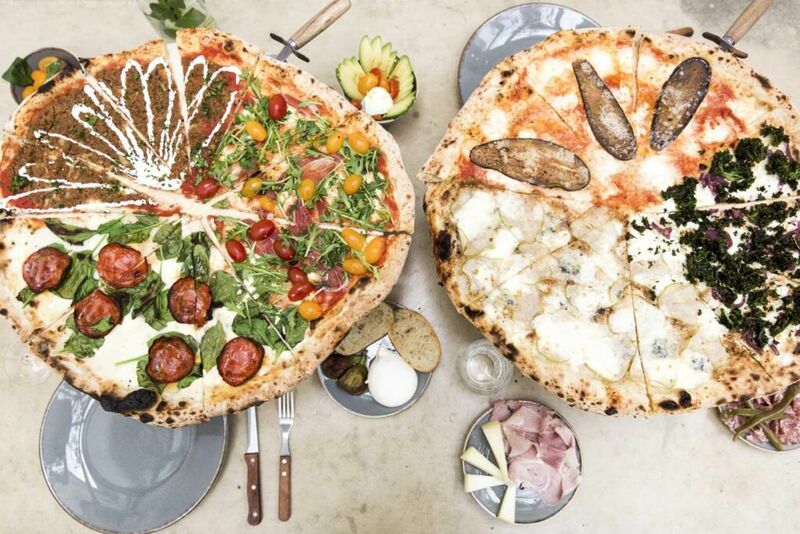 Pi’s enormous 20-inch sharing pizzas (enough for 2-3 people) are where it’s at. They’re served on raised platters and can be divided into thirds to try three topping combos. Thanks to the dough’s fermentation process, you get the best of both worlds texture wise. Crusts are chewy and puffy, without being dense and the base is thin, giving a satisfying crunch while allowing the flavours of the toppings to shine through. Instead of my usual pushing of the crusts to the side, I found myself wanting to fill up on them, dunking them into Pi’s homemade chilli oil and savouring bite after heavenly bite. I was in carb heaven. Toppings range from favourites like Margherita, to inventive creations like Lebanese spiced lamb with Turkish yoghurt. Pi caters for vegans and vegetarians too, with three vegan pizzas and a vegan dessert. The Hampshire pork sausage and sage, with sweet roasted butternut squash made for the perfect savoury and sweet combo. The Nduja, ricotta, mint, jalapeno jam was another favourite. It was rich and fiery and the jalapeno jam was seriously tasty. If you’ve room for sides and starters, the super creamy Burrata with sticky caramelized fig is utterly delicious. Those with a sweet tooth will want to leave room for dessert – they’re lovingly homemade. 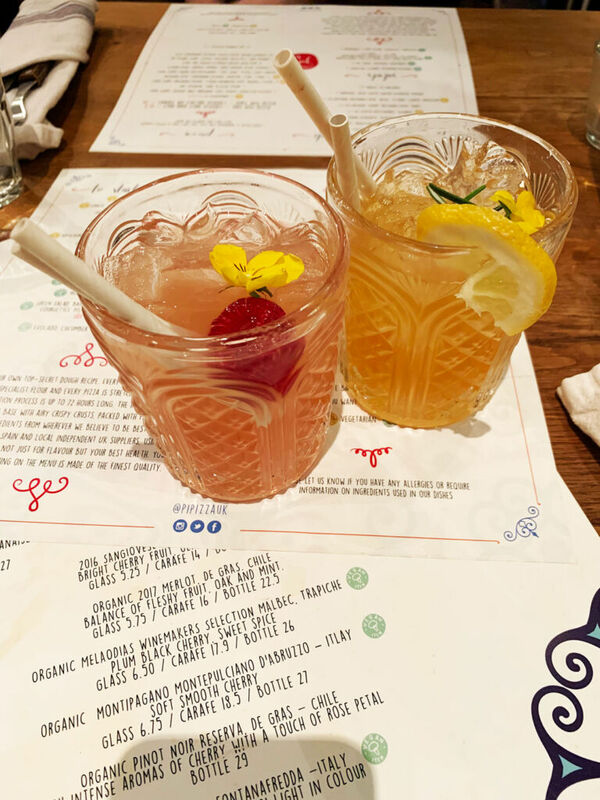 Pi’s bar serves up bespoke cocktails, organic wines and craft beers. The bar boasts a beautiful ceiling of wildflowers which is perfect for pre-pizza cocktails. 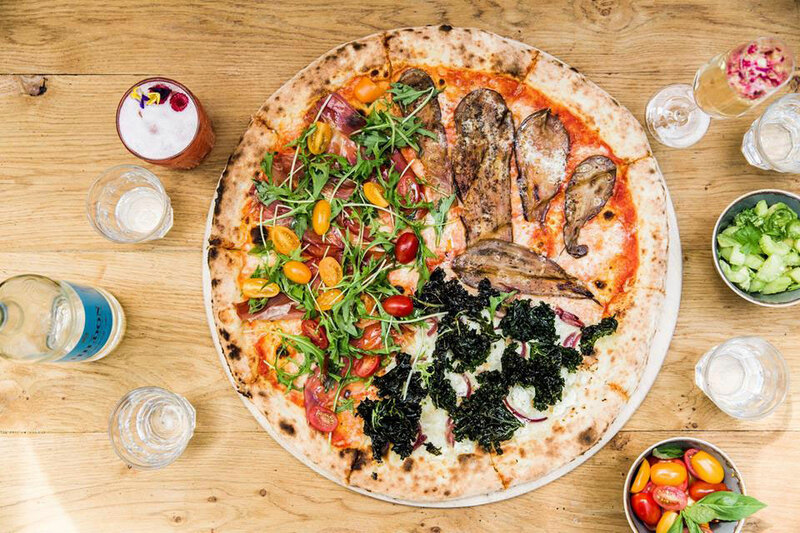 With expertly crafted, flavour packed pizzas, stunning interiors and a buzzy, neighbourhood vibe, it won’t be soon until this newcomer makes it to the top of the best pizza in London lists. Pi Pizza – Where & How? Pi Pizza is located 4-6a Battersea Rise, London SW11 1ED. It is a 10-minute walk from Clapham Junction train station – you can be there in 20 minutes from Waterloo. The restaurant is open Tues – Sunday, with live DJs on a Saturday night. There are takeaway and delivery options too. For bookings or to find out more, visit battersea.pi-pizza.co.uk or call 020 7978 5542.